Bundesliga | Could 2018 World Cup snub get Borussia Dortmund's Mario Götze back to his best? Where was Mario Götze early on Tuesday afternoon? Training with his Borussia Dortmund teammates perhaps? Enjoying a siesta at home? He may even have been waiting impatiently to find out what Joachim Löw had to say. "He has unbelieveable potential and is a player I believe in," Löw said only in March. "We have to help him work on it and use the next two months." Positive words from the man who had told Götze when coming off the bench in Brazil four years ago to show "you're as good as Messi" before his extra-time goal earned a fourth star on Germany's shirt. If there is to be a fifth in Moscow in July, the hero of Rio will have no part after not stepping up in the last weeks of the season to give Löw — clearly partial to the Dortmund man's undoubted talents — any sort of excuse to pick him. 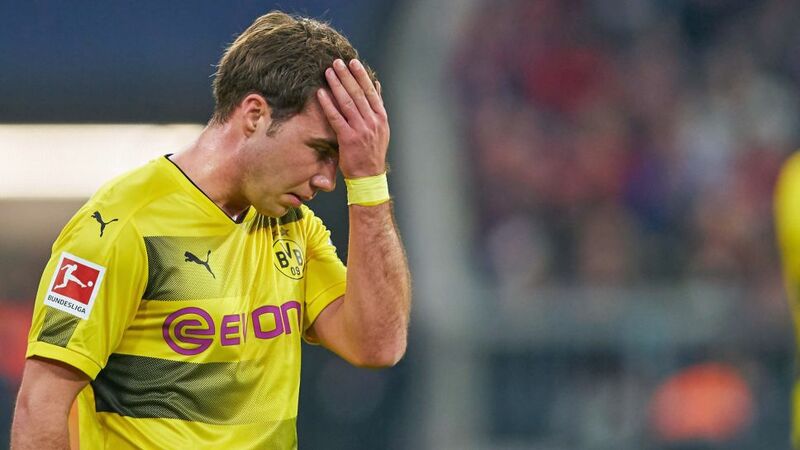 Götze had even played the most minutes of any forward in qualifying, yet still missed out. Why? Like the rest of Peter Stöger's squad, Götze limped to the end of the campaign, his form tailing off badly to leave him with no goals and just a single assist in his last nine league games. With no shortage of attacking midfield brilliance with the likes of Julian Brandt and Leroy Sane added to usual suspects such as Thomas Müller and Mesut Özil, it was difficult to make a case for Götze based on his 2017/18 showing, the latest in a string of campaigns he has limped through even before he became the nation's darling that balmy night in the Maracana. In 2014, Franz Beckenbauer had claimed there was "nobody better" than Götze and Marco Reus. Reus' shirt was famously brandished during the celebrations on the pitch in Brazil after injury had cruelly deprived him of his World Cup winner's medal. Götze, who is only 26 — yes, he HAS been around for ages, but made his debut in 2009/10 aged just 17 — can take comfort from his Dortmund teammate's example as he seeks to rebuild career, reputation and — most importantly — confidence. His 2013 transfer to Bayern Munich seemed to be the moment Götze's career should take off. Sizzling, spectacular and — most noticeably — insouciant at the top level, he had brilliantly complemented Shinji Kagawa, Lucas Barrios and Robert Lewandowski, outshining them even on many an occasion. But the "boy wonder" as Löw described Götze never developed into the 'man wonder' everyone had eagerly anticipated in three years at Bayern. His 2014 World Cup-winning goal was struck at the end of a delicate first campaign in Munich, spectacularly papering over the cracks. "It hasn’t been a simple tournament, or year, for me and I owe a lot to my family and my girlfriend who always believed in me," he said in the delirium of Rio. "But a dream became reality here." He has had little chance to shut his critics up and even less to recapture the thrilling brilliance he showed under Jürgen Klopp in his first stint in the yellow-and-black shirt. Metabolic problems ruined 2016/17, and flashes of his genius were all too fleeting in the 23 games in which he featured in 2017/18, the most he has played in the last three seasons. Though the disappointment at missing out on the trip to Russia must be huge, Götze will perhaps later acknowledge it was a blessing in disguise. His body can fully recover over the summer, and he can enjoy a full pre-season of blood and sweat, which will hopefully lead to a campaign of far fewer tears than he has been used to in recent times. "He was unbelievable," said Klopp of his former protege, whom he handed a Bundesliga debut as a raw but brilliant teenager. He was brilliant, exceptional, diminutive in size, but towering in talent, potentially the next Messi. Though he now will have to settle for sitting on his sofa and watching the Argentine try and exact revenge on Germany, the very fact Götze is doing that could be just what the Dortmund man needs to be the star attraction in Qatar in four years' time.